The migration to the cloud went hand in hand with a paradigm change in the design of modern IT solutions. Where IT configurations were once small, manageable, and defined at the department level, the big picture has now become the focus of attention: Setups from dozens of endpoints need to work as one well-integrated unit. Automation plays a key role. With more systems covering larger spaces, many admins prefer to invest their time up front in labor-saving custom tools that will save time and energy on repetitive tasks. Puppet  and Chef  are two open source configuration management tools that skillfully support admins with comprehensive, automated server management. Chef and Puppet are direct competitors. Admins who use at least one of these solutions consistently and correctly can significantly simplify their everyday lives. However, Puppet and Chef both have pitfalls that you'll need to steer around. This article is a kind of inventory, based on my experience, of some of the issues concerning practical operations with Chef or Puppet. You will find countless comparisons of Puppet and Chef  on the web; depending on the source, sometimes Puppet wins, and sometimes Chef prevails – the choice ultimately comes down to the details. Read on for some issues to consider before you choose: Puppet or Chef? 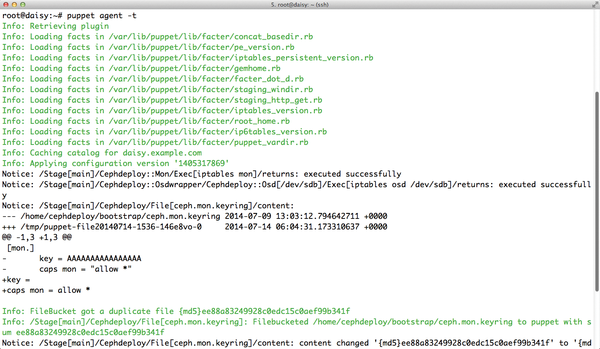 Chef is essentially imperative; Puppet is declarative. In concrete terms, this means: With Chef, the admin defines which commands need to be processed and in what order by creating a cookbook with commands in the appropriate order. In Puppet, admins instead describe a desired state using the Puppet manifest and then define the steps that lead to this condition. Resources can be connected via dependencies. One faulty run of the Puppet agent on a system does not necessarily mean that the node is unreachable. To fulfill dependencies – even beyond the borders of hosts – it might be necessary to run Puppet multiple times on a host. Ultimately, the Puppet agent always leaves a system in a consistent state, although consistent does not necessarily mean that all the steps were actually performed on the host. A design difference of this magnitude is rarely the decisive reason for or against Puppet or Chef, but it does significantly contribute to acceptance of the solution within the admin team. After introducing the solutions, it is not easily possible to switch to another; a careful evaluation of the options in advance is therefore necessary in any case. The issue of resources is of overriding importance for both Puppet and Chef. A typical Puppet setup is based on a central server that provides its surrounding hosts with data. The host is known as the Puppet master server; all agents on all your computers call it to obtain information about their own configurations. The Puppet master server can sometimes become the bottleneck. If you have watched a Puppet agent at work, you might have noticed the log line that reads Fetching Service Catalog. The service catalog is basically a list of all the resources that will be managed by Puppet on each host. A resource, in turn, is an individual service, whether a configuration file you need to install or a service you need to launch. The devil is in the details again, because the agent does not generate its service catalog on the target server itself. Instead, the master server generates the catalog, then the client downloads it and works through the list of resources. In smaller installations, the system load for generating service catalogs is not a problem because the requests from the Puppet agents are distributed over time. Individual catalogs cause very little load on the master server if the system is powerful enough. The master servers in larger setups quickly start to suffer under the burden of many simultaneous requests (Figure 1). Figure 1: In Puppet, a large part of the load is typically borne by the Puppet server. Configuration steps are compiled as a catalog on the server and then sent to the client. The situation can deteriorate to the extent that individual clients can often no longer download their catalogs when other clients are also running Puppet agent calls. One solution to this problem is equipping the Puppet master server with more powerful hardware. Many CPUs, a good helping of RAM, and an SSD can help alleviate the bottleneck effect on the master. If you use Chef, you are lucky, because Chef is designed differently: The clients generate their configurations themselves, even through a central Chef server is used. Another solution to the potential bottleneck caused by the Puppet master is a "masterless" configuration, that is, a setup that does not rely on a master server. The advantage of eliminating the master is that there is no longer a central instance causing performance problems. However, this approach is fraught with security risks: Each server stores all parts of the Puppet configuration that relate to it – possibly including the definitions of other servers; security-wise, a masterless setup is a real nightmare. It has become customary to avoid storing passwords in plain text in files, but in the standard version of Puppet, you have no other choice. Even passwords that are stored within Puppet on the Ruby-based Facter framework  are unencrypted. If you run a Puppet setup without a master, all the configuration files must reside on the hosts. That means you will also find almost all of the configuration files on the hosts. This type of design is hacker heaven: If you crack a box, you can capture several passwords for different services and thus explore the network almost at will. Chef used to suffer from a similar problem, but now Encrypted Data Bags  let you store information server side in encrypted form. If you use Puppet, you must make do with third-party software. To properly protect the data from prying eyes, use Hiera and the Hiera extension hiera-eyaml  by Tom Poulton. However, the Hiera solution describes a specific Puppet setup, which is unlikely to exist in most corporations. Anyone who operates a classic Puppet environment without Hiera currently has no options for encryption. This problem is aggravated in masterless Puppet setups, given the need to protect the systems against unauthorized access. If you really want your evenings to belong to your job, you don’t need to depend on configuration management. But is all your overtime really necessary just to configure a server system? Configuration should just happen by magic these days; after all, we’ve had computers long enough to understand how to get it right.